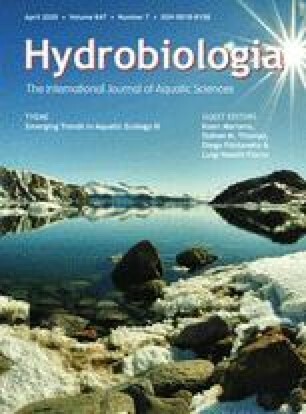 Distribution and seasonal dynamics of freshwater Rhodophyta were investigated in the Preto River basin, located in northwestern São Paulo State, southeastern Brazil. Twenty-two sites were sampled, six monthly during one year, four bimonthly during two years, and 12 twice (hot-rainy and cool-dry seasons) during the study period (May 1989 through March 1991). Red algal representatives were found in 19 sites (86.4%). Four species occurred in the basin with varying frequencies:Batrachospermum delicatulum (54.5%),Compsopogon coeruleus (36.4%),B. bicudoi (13.6%) andB. virgatum (4.5%). In addition, ‘Chantransia’ stage of the batrachospermalean species was found in 17 sites (77.3%).B. bicudoi, B. virgatum andC. coeruleus occurred only in large stream segments (≥ 3-order), generally in the main river, whereasB. delicatulum was more frequent in small streams (≤ 3-order). The stream variables most closely related to the species distribution in the basin were specific conductance, pH and oxygen.B. bicudoi andB. delicatulum showed a marked seasonality: gametophytes were observed from late fall to early spring, while the ‘Chantransia’ stage generally occurred throughout the year.C. coeruleus was observed throughout the year in most sites, but the populations were generally more abundant from late fall to early spring. The combination of lower temperature and reduced turbidity resulting in increased illumination to the benthic algae during the dry winter months promotes the gametophytic growth of the batrachospermalean species, whereas current velocity was found to be the most influential stream variable forC. coeruleus. The persistance of the ‘Chantransia’ stage throughout the year as well as its tolerance to wider environmental conditions are key factors in the efficiency of the batrachospermalean life history strategy in lotic ecosystems.